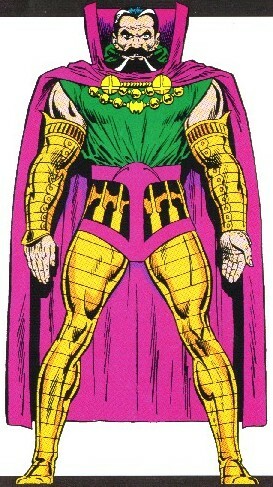 Powers/Abilities: Nicholas Scratch has vast knowledge of magical lore, enabling him to manipulate magical forces for teleportation, energy projection, animation and control of inanimate objects, and the tapping of extradimensional energy by invoking entities or objects of power existing in dimensions tangential to Earth's through the recitation of spells. He could formerly perform mesmerism, thought-casting, illusion-casting, mental probing, and possess the minds of others. 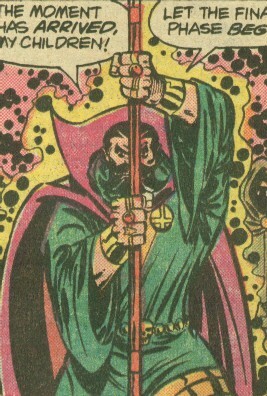 Scratch uses the "Satan Staff," a mystical power object that serves as a focus for his powers. Using the staff he could direct the combined magical powers of the entire community of New Salem when they allowed him to do so. His powers were removed in the past, but have returned to an unspecified degree. Scratch, like his mother, may be resistant to aging to some degree. (Fantastic Four I#185 (fb) - BTS) - Scratch, now the leader of the witches of New Salem, convinced the others that Agatha Harkness' interaction with the Fantastic Four and others had betrayed their existence to the public (despite the fact that she had actually never mentioned them to anyone). He similarly convinced them that she must be executed for this perceived treason. (Fantastic Four I#181 - BTS) - Agatha abducted Franklin Richards, hoping that his powers would help ward off the witches pursuing her; she was unaware that Franklin's powers had been contained by Reed. (Fantastic Four I#182 - BTS) - The witches of New Salem abducted Agatha and Franklin from her home on Whisper Hill, transporting them to New Salem. (Fantastic Four I#184 - BTS) - As the Fantastic Four arrived in search of the missing Franklin, the witches sent the Eliminator construct to Whisper Hill to destroy all evidence that it had ever existed. The FF feigned defeat until the Eliminator destroyed itself after the destruction of the mansion. (Fantastic Four I#185) - Reed tracked the Eliminator's shell to New Salem, which Scratch and the witches used illusion to appear as a normal town. The FF completed their investigation and were prepared to leave when Agatha created a wall of flame to force them to realize that there was more going on than what they could see. The deception over, Scratch and the witches revealed themselved, and Scratch animated a number of stone gargoyles to attack them. As the heroes overcame them, Scratch led the witches to take control of Ben, forcing him to beat both himself and Reed into unconsciousness, and he covered Sue in mud and used her as a missile against Johnny, dropping them both, as well. (Fantastic Four I#186) - Scratch used Franklin as a hostage to force the FF to stand back during Agatha's trial. The FF escaped, overcoming the Salem's Seven in the process, and confronted Scratch at the trial. As they argued that Agatha had never mentioned the existence of New Salem or any of its inhabitants, and that it was actually Scratch's actions that had revealed them. Scratch slew one of the warlocks who asked them to elaborate, and the rest of the witches recognized him for the evil that he was. Using the spell of Eternal Banishment, they sent Scratch to the Dark Realm. (Fantastic Four Annual#14) - At the annual purifying Ceremony of Renewal, the Salem's Seven disrupted the energy flow, using it to open an energy portal to Scratch, returning his power. 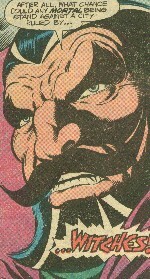 Scratch, in turn, returned full power to the Salem's Seven, who overpowered the Fantastic Four, who had accompanied Agatha Harkness to the ceremony. Scratch then used his power to immobilize the other witches while he had the Seven perform a separate spell that would simultaneously return him to Earth and destroy the Fantastic Four. A number of heroes, including Captain Mar-Vell, Nighthawk, Quasar, and the Avengers (Captain America, Falcon, Iron Man (Stark), Ms. Marvel (Danvers), Vision, Wonder Man), and even the US Army, attempted to break through the magic shield of the Seven, to no avail. Scratch succeeded in taking control of the Fantastic Four, but Agatha transported Franklin Richards to the site of the Seven's spell. Drawing on Franklin's resurfacing power, she banished the Seven back to New Salem, and banished Scratch back to the Dark Realm. (Fantastic Four I#222) - Scratch detected a small portal from the Dark Realm into the Negative Zone, from which he found the portal to the Baxter Building and possessed Franklin Richards. The Fantastic Four summoned Agatha for help, and failed efforts to locate Dr. Strange made the notice of Desadia, who informed Gabriel of the events. Gabriel exposed Scratch's involvement, and Scratch forced them to travel to New Salem or he would destroy Franklin. (Fantastic Four I#223) - Gabriel contained Scratch's presence, preventing him from antagonizing the others during their trip to New Salem. Scratch freed the Salem's Seven from their prison in New Salem, and the Seven successfully overpowered the Fantastic Four, Gabriel, and Agatha. However, as Scratch subsequently tried to merge the Dark Realm with Earth, Gabriel and Agatha mobilized the astral selves of the Fantastic Four and used their love for Franklin as a weapon that would annihilate them all if Scratch did not cease his actions. Scratch conceded, restoring the Dark Realm to its pocket realm, and Agatha stripped Scratch of his power and denounced him as her son. (Vision and Scarlet Witch II#3 - BTS) - Scratch escaped and/or survived the apparent destruction of the rest of the witches of New Salem. (Hellcat#1 (fb) - BTS) - Scratch sought new power as the servant of Dormammu. As such, he manipulated events to become the leader of the town of Centerville as Mayor Nicholas, entering into an alliance with the snake demon Daboia. As Mayor Nicholas, he assisted in the recovery of the crumbling town, particularly in the endeavors of Hedy Wolfe to turn the town into an amusement park. (Avengers Annual 2000) - Alongside Daboia, Scratch was introduced to Patsy Walker by Hedy. When Patsy detected the demon presence in Centerville, she summoned the Avengers (Captain America, Iron Man, Scarlet Witch), as well as Hawkeye, Moondragon, and Songbird, and they encountered Daboia, the Sons of the Serpent, and the Salem's Seven (presumably lent to Daboia by Scratch). When Patsy and her allies defeated Daboia, they believed the danger to be over, as Scratch had intended. However, Scratch realized that Patsy suspected that Daboia had served another master. (Hellcat#1) - "Mayor Nicholas" offered his sympathies to Patsy for her recent troubles, but as she continued to suspect problems, he sent magical agents to assault her. She defeated them and confronted Scratch, managing to disarm and stun him. However, when she mentioned Mephisto, Scratch revealed it was instead Dormammu whom he served, and Dormammu then appeared and teleported them both to the Dark Dimension. (Hellcat#2) - Scratch stood by Dormammu as he revealed to Patsy his plans to conquer the various underworlds, and claimed that he would become Sorcerer Supreme in the new Underworld order. (Hellcat#3) - Scratch stood by Dormammu and Satannish as they threatened to conquer the other underworlds. However, when the other Hell Lords joined their power to literally cause Hell to freeze over, Dormammu was weakened by the lack of flame, and was forced to have Scratch join his power to his own to escape. (Marvel Knights 4 #25 / Marvel Knights 4 #27 (fb) - BTS) - Posing as Agatha Harkness, Scratch duped Salem's Seven into preparing events to resurrect Nicholas Scratch (though he actually intended to summon Shuma-Gorath to Earth). Salem's Seven performed a series of magical assaults on New York City. (Marvel Knights 4 #26 (fb) - BTS) - Nicholas Scratch magically ambushed and imprisoned Dr. Strange and Wong in a pocket dimension. (Marvel Knights 4 #26) - Scratch freed Diablo from the realm into which the Fantastic Four had imprisoned him. Posing as Dr. Strange, Nicholas Scratch tricked the Fantastic Four into reading a spell to liberate Shuma-Gorath, bringing him to Earth. (Marvel Knights 4 #27) - Scratch offered up both the Fantastic Four and Salem's Seven to Shuma-Gorath, who protected him from the heroes' assaults. Dr. Strange--freed by Diablo--arrived and teleported Shuma away, and then Diablo modified Scratch's liberation spell, so that Franklin & Valeria Richards could use it to banish him to Hell. Within Hell, Scratch agreed to become Mephisto's agent in the coming war. Comments: Created by Len Wein and George Perez. Scratch's very identity (both Nick and Scratch are other names for the devil), follows the VERY commonly mistaken ASSumption that witches worship the devil. Most witches (or Wiccans)--including the couple I know--may be pagans, worshipping an Earth goddess or others, but they differ from satanic cults. It's almost futile to resist this mistaken idea, as it seems to be ubiquitous. In Fantastic Four I#223, Agatha refers to the witches of the New Salem as the eldritch goldeneyed. 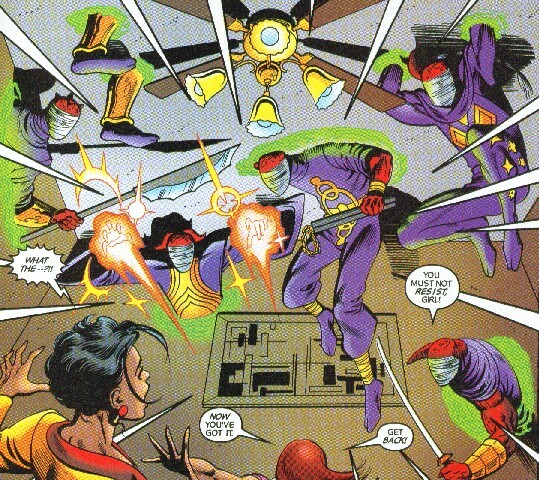 The agents summoned by Scratch in Hellcat#1 look reminiscent to the Agents of Fortune, but no connection was ever mentioned. The information from the Hellcat series about the connections between Satannish and Hellstorm have since been revealed as falsehoods, which Daimon led Patsy to believe so that she would see him as evil and thus distance herself from his darker life. See the Marvel Knights Encyclopedia and the Horror handbook: Hellstorm entry. Another problem from the Hellcat series was the idea that there were only five realms of Hell. I guess there may be the five biggest realms (under control of Mephisto, Satannish, Hellstorm, Hela, and Pluto--though the last two would be realms of the dead, rather than Hells, but anyway...), but there are countless splinter realms, as better displayed in the second Magik limited series. Actually, while I enjoy Englehart's stories, he often uses very odd reasoning to rationalize events, which often detract from the overall story. I still think he's a great writer; just one criticism, that's all. Either demons or mutated humans, they attacked Hellcat in Centerville at Scratch's command, but were defeated. They wielded staff, nunchaks, swords, throwing stars, etc., and could also pass through solid matter, project mystical blasts or form constricting rings of magical force.